What’s the basis for the 9’ estimate, the other researchers that were with you? They saw it in the fully upright position? I'd like to not derail this thread further but he top of the arm that I saw was at about 9 feet making it taller than that IF I'd have seen it standing straight. I called it 10 feet earlier in this thread, because I knew it was near the top of an 11 foot stick. Problem is that it was further back than that stick so my math might be whacked.The guy with me saw it standing and saw most of the upper body and head but he was not available when the BFRO investigator was there. He DESCRIBED the way it moved before he knew that I had seen it, and what he described exactly matched what I did see. When I get back to do a better re-creation I'll try to have him along to see where he says the head was when it was standing. Despite the errors I now see in our attempt to find height, I still think the 9-10 foot estimate is close. I have reasons for that 'opinion' but cannot really verify until I get back there to do it correctly. I will work on images to demonstrate later (but not in this thread). I promise I'll disclose more info and images once the report gets published. Thanks for the reply Redbone. Look forward to your follow up, if you get the time. I will leave it at that as not to derail the thread any further. Is how believable a thing is a measure of the truth of the thing? Or is simply an arbitrary measure necessary to have your hoax accepted? Serious question. Why does anyone need to make a true "story" believable to others? Isn't that what hoaxers need to do? It's not so much the height that I have a problem with, but the thickness. If I met it in the woods? It would be BOTH! Wowzer! Here’s another glorious statue of a big hairy (splintery? : p) fella. Let me know what y’all think..
Wowzers! What a beautiful art piece of a big hairy (splintery? : p) fella. Let me know what y’all think.. It does seem a bit .. stout. 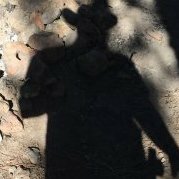 I assume you're familiar with Jim McLarin's "sasquatch weight estimator" that predicts what a sasquatch of various heights might weigh based on various build profiles? Some of the numbers for the heavier builds make my head spin on one hand, and yet on the other, they align more reasonably with the feats of strength reported than lighter builds do and they fall in line with some of the track depths like Bluff Creek. Dunno, just thinking out loud I guess. 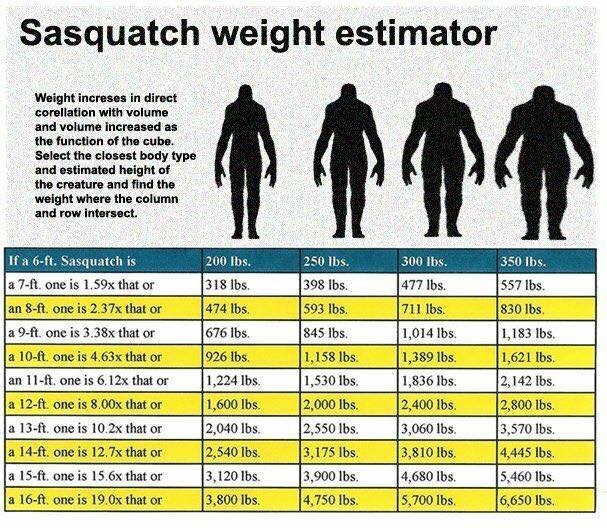 I assume you're familiar with Jim McLarin's "sasquatch weight estimator"
Actually, no. Is there a link somewhere? I googled it and nothing came up. 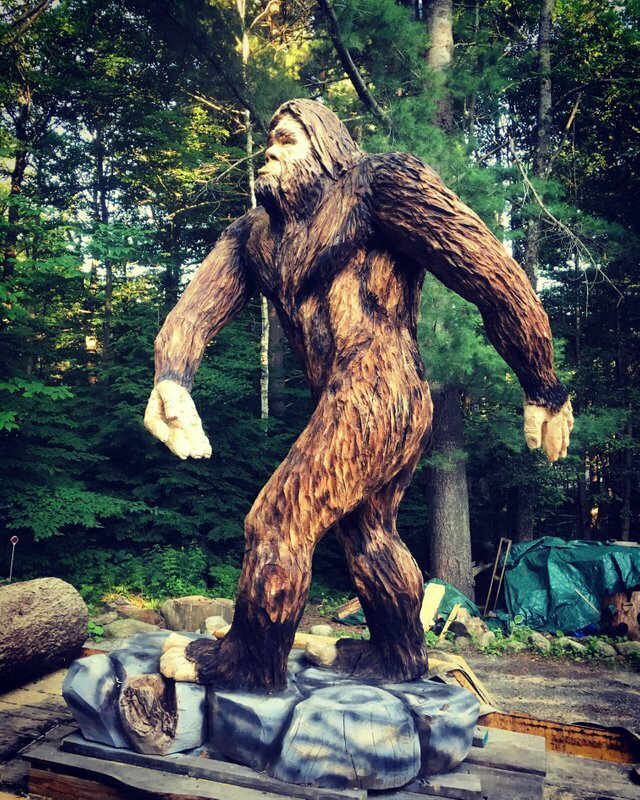 "Jim McLarin of Willow Creek, California, was the first to apply this principle to sasquatch dimensions by taking a base figure of 6 feet tall and 300 pounds body weight, and extending on this. A curve drawn from this base line gives 134 pounds instead of 127 at 4 feet 7 inches, 477 pounds instead of 500 at 7 feet, and 852 pounds instead of 850 at 8 feet 6 inches. All three instances fit the curve very closely (Fig. 1)." I don't recall where I got this .. well, I do, it was a member of a group I used to camp with, but I don't recall where he got it. 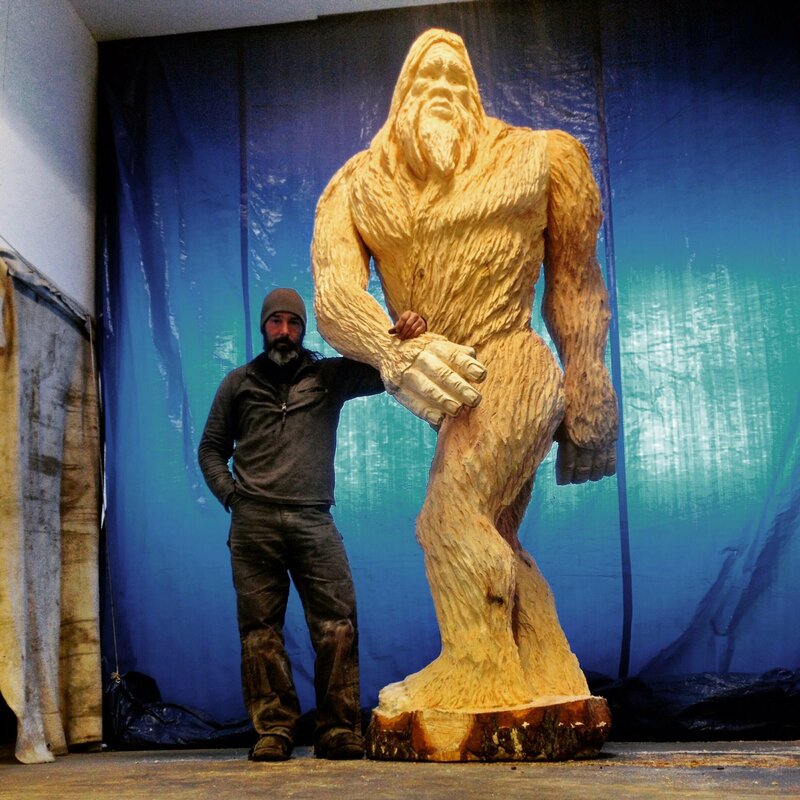 Here’s another beauty of a 9 foot high by 7.5 wide Squatch. Hope y’all enjoy..